The plan of the cervical and brachial plexuses. The spinal cord with spinal nerves. 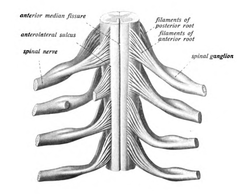 The thoracic spinal nerve 1 (T1) is a spinal nerve of the thoracic segment. It originates from the spinal column from below the thoracic vertebra 1 (T1). This page was last edited on 12 February 2018, at 00:46 (UTC).